Hills Prescription Diet ZD Food Sensitivities Dry Food for Adult Dogs is a complete and balanced diet for the nutritional management of dogs with food allergies and/or food intolerance. Food allergy and intolerance are potentially serious problems that can result in sensitive skin, coat and ear conditions and even digestive problems. Using Hills Z/D regularly has been clinically proven to help avoid these adverse reactions. 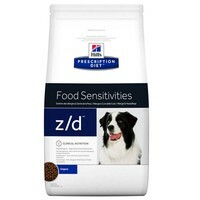 I have been using z/d for 2 years now, my field spaniel has a protein allergy, this diet is amazing for her, she has the dry biscuit, we use them as treats as she is not allowed anything else and she loves it. Thoroughly recommend this product if you have a dog with an allergy. It has turned her life around, she is incredibly well now, no more skin breakouts or bad ears. When we first got our dog Cleo (great dane/rhodesian ridge backcross) she was 18 months old, and had ear problems. She was constantly scratching her ears, and was very miserable. The vet diagnosed a severe food allergy and recommended ZD ultra low allergen food. Within 2 weeks she was a changed dog. She is now 13 and a half years and only ever has ZD ultra low allergen dry and wet food. Although she is now a bit slow she is in excellent shape for her age. Although this food is expensive (especially for such a big dog) it has saved us endless vets fees. I thoroughly recommend it. i have a lurcher with acid reflux and digestion problems which was a constant battle as far as food is concerned as he was unable to digest other brands or had severe acid which caused him sickness and nausea almost weekly. we have used ZD for the last two years with superb results. thoroughly recommend trying this product. Our westie dog was bald in places, where he had scratched himself so much, we were given the usual steroids and antibiotics and special shampoo, time and time again, eventually our vet recommended we saw a dog dermatologist in Swindon, so we went there and she put our dog on this Hills ZD Ultra, so we bought the cans of wet food and the dry, which we could also use as treats as well, we were told to feed nothing else, no markies, no nothing only the Hills ZD Ultra for 6 weeks, and when we took him back he was a totally different dog! full coat, no scratching, no ear infections. If you have a dog with severe scrathing, then follow the above and see if it works for you, it won't harm your dog, and it might save you a lot of money on vets. Our dog is on this for life, but he loves it so no problem. I have told several dog owners about this, and they have tried the Hills ZD and found it worked for them. Most people say why haven't our vet told us about the food, it would be wrong of me to suggest it's because they want to keep on treating your pet this is for cats as well, as that's how they make their money! I have got Bichon Frise with a severe skin allergy. I have been recommended this product by my Vet as the last resources to control the skin problem. The dog loves the taste of it, and the skin condition has improved dramatically over 10 days.